Welcome To Your Senses: Apppaaadaaa ! Appada ! The way the movie swayed, I thought it would drown two people. Manickam Narayanan and Gautham Menon. Thankfully the movie made it to the shore. 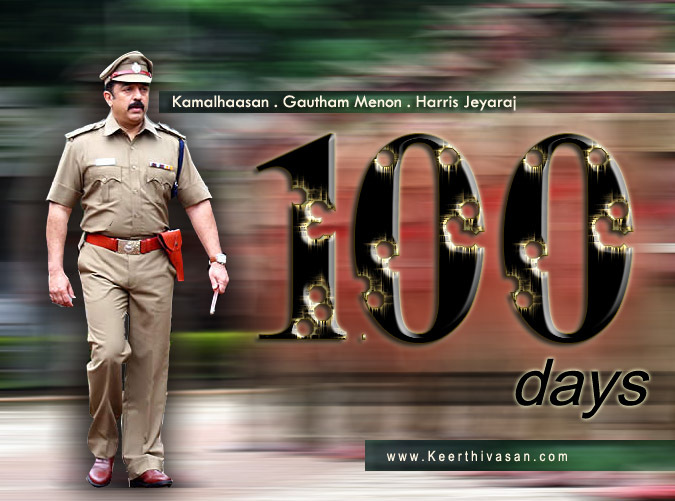 Tomorrow, we have the 100th day celebration on the Sathyam. Boss is attending right after his shooting in the US after 10A. He fit in the role perfectly and Im about to raise a opinion poll. Who among these Fit in the Cop Image the best. Im not talking about the role. Its the appearance. The Appeal. Let me know. Talking of VV, Gautham Menon owes this success to Kamalhaasan and Harris Jeyaraj. Without them it is a kiddish movie. This movie may not be deserving this success. Im sure it was made to run in theatres for just the numbers. Yet, unlike Chandramukhi running for 500+ days and Vijay movies that are made to invariably run for 150 days and more, this movie did make a box-office impact. Good collection like this is long due from Kamalhaasan, and producer Manickam Narayanan should be all smiles after this success. Boy what a roller-coaster ride he had !! I'm eager to listen what Kamal has to say about this success. What should he do ? Eat a Humble pie ? UPDATE : Was there at Sathyam yesterday morning for the 100th day function. Not too many celebrities. Even Mrs. Jothika didnt turn up. Kamalhaasan, however, made my day with that awesome look. The talks were as usual boring except for Kamal and Parthipan. The audience were roaring all the time. Kamal has so many fans and even at this period of time. Yet, some stupid article mentions the popularity of Tamil actors "Rajini, Vijay, Vikram, Ajith and Kamal" in that order. How dare they ? Keethi, wouldn't "Captain Prabhakaran" Vijaykanth be more apt? IMO , Vaalter Vetrivel Sathyaraj's appeal was the best. He potrayed a stern police character very well. surely it would'nt have drowned Gautam Menon who has 2 more movie on cards. "Im sure it was made to run in theatres for just the numbers"
1) Nowadays a movie makes most of its collections in the initial weeks. Hence, the focus has shifted from number of days to number of screens/shows/seats/rates. VV had a monstrous opening, perhaps the biggest EVEN THOUGH IT WAS RELEASED ON A WEEKDAY AUG 25TH. It broke records overseas, and made good colelctions in KN and Kerala. Its yet to be releases in AP. 2) Aandavar doesn't thechify his movies like others. 3) "Good collection like this is long due from Kamalhaasan,"
4) "I'm eager to listen what Kamal has to say about this success. What should he do ? Eat a Humble pie ?" - What???? Why should he eat humble pie? I am a true Kamal fan and any part of the post doesnt make it void. I expeced Kamal to eat a humble pie, because I think he did a mistake accepting this screenplay. I thought he would vent out his real expressions even though he movie is a success. He spoke totally in general,and we could fit that speech into any movie's 100th day celebration. There was nothing about the movie in his speech, if you could recollect. He is so pissed off with this movie, and does not care to give a damn about it. It showed up. Ravi, Gaptain ?? Nejammava ? Princess, thanks. I found it somewhat funny, when he says.. "Vetrivel !! 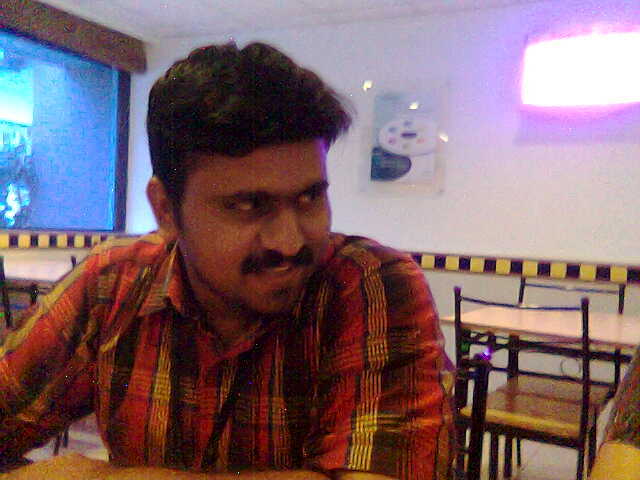 Vaalter Vetrivel". 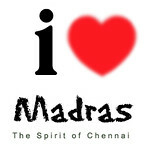 Narayanan, It certainly wouldn't have, wrt living. But it would let down the expectations from him. Always anything should end with subham. Kamal in the last and thus adds value all the other actors. kamal will have lots of fans for ages to come.. when people like me are shouting our hearts out, he will rock..